A very finely detailed gilt brass clock in excellent condition, the original gilding is in lovely bright and clean condition. It is modelled in the Baroque style with hairy paw feet, lions mask above the dial, goddess mask below the dial and mythical creatures to each sides of the urn......Click here for full details! 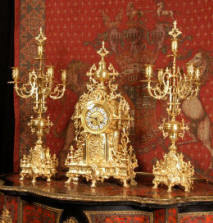 Stunning Antique French Gothic Table Clock Set by Samuel Marti. 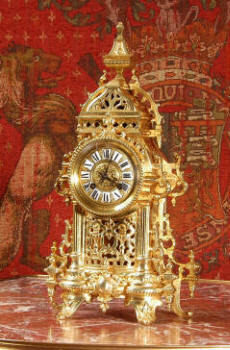 A superb and unusual gilded brass table Gothic clock set by the famous maker Samuel Marti. 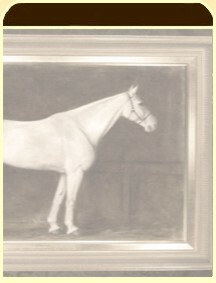 It has a beautiful original gild which is bright and clean....Click here for full details! 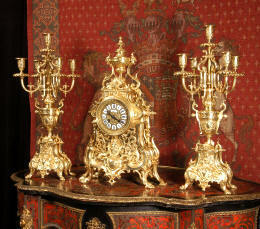 Stunning Antique French Gilt Brass Clock Set. 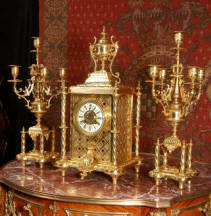 A beautiful antique French Louis XVI style clock set 'Garniture de cheminee'. It is very well modelled in gilded brass in the Louis XVI style. The case is architecturally shaped, profusely decorated with floral swags. The front of the case is fretted to allow the pendulum to be glimpsed swinging inside the case......Click here for full details! 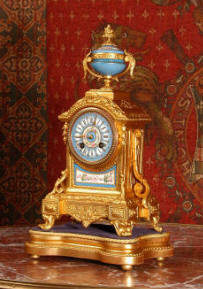 Japy Freres Sevres porcelain and Gilt Metal Boudoir Clock. A beautiful, small Japy Freres boudoir clock, gilt metal with exquisitely painted porcelain panels in the manner of Sevres. Porcelain has a pompadour blue ground decorated with floral swags and over glaze gilt decoration. It is complete with it's original velvet covered gesso base. 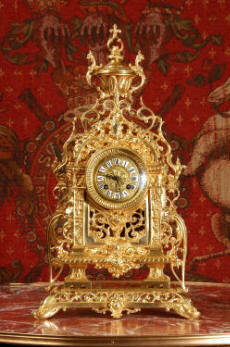 Large Antique French Rococo Clock. 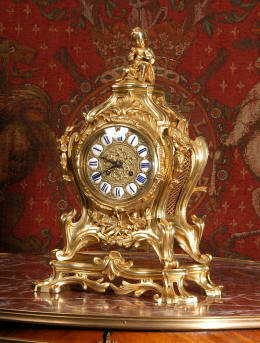 A large and stunning original antique French brass table clock in lovely condition. The style is Rococo, waisted keyhole shape with acanthus leaf shoulders, 'C' scroll bracket feet The design is beautifully bold and heavily moulded in brass, well chased and finished. It is modelled in the round and so would display very well on a table......Click here for full details! A very decorative antique French table clock. It features lion's mask handles to the sides, hairy paw feet and a beautiful enamel dial painted with a floral swag. Below the dial, the front of the clock is fretted to allow a glimpse of the pendulum swinging within the case. 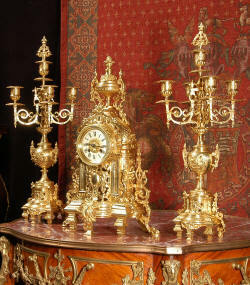 A superb clock set or 'Garniture de cheminee' in beautiful clean and bright gilded brass. Modelling of the set is superb, heavily formed with crisp, clean and well finished edges. It is in the style of Louis XVI, profusely decorated with fretted foliage and floral swags, scrolls and masks......Click here for full details! 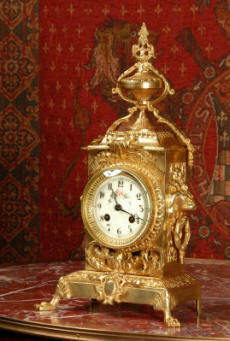 A lovely and very decorative clock of gilded brass. 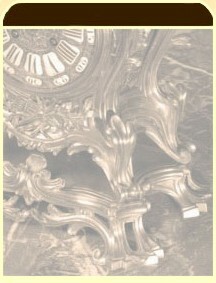 It is shallow enough to fit on most mantles but could also be displayed as a table clock. It is modelled in the Gothic style and has a fretted panel to the front to allow the pendulum to be seen swinging within the case. To each side of the fretted panel are reeded columns and above the dial is a pierced top with a finial......Click here for full details! 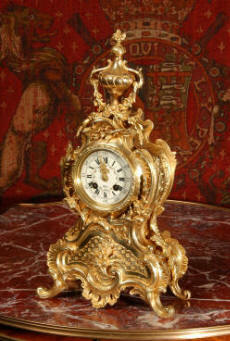 A lovely original antique French Rococo boudoir clock. Typical asymmetric, waisted designed with laurel leaves, 'C' scrolls and floral swags. The dial is cream enamel on copper with delicate floral swags between the Roman numerals and finely fretted gilt brass hands......Click here for full details!